I’ve had Ippudo ramen on my radar for over 4 years. It’s been sitting on my “to try” list since I read that it’s one of the best ramen in New York City. But on my first, and then subsequent visits to NYC, I haven’t visited because it’s never been convenient and I haven’t been able to convince myself that ramen in NYC could be better than any of the other dining choices I could make there. I put Ippudo on my list again for this trip to Japan, but it was on my Tokyo map because my Osaka/Kyoto maps were much less detailed. I did less research on the second half of my vacation, knowing that my parents and relatives would have fantastic food suggestions. But again, in Tokyo my eating card was so full that Ippudo didn’t come close to making it off the list. 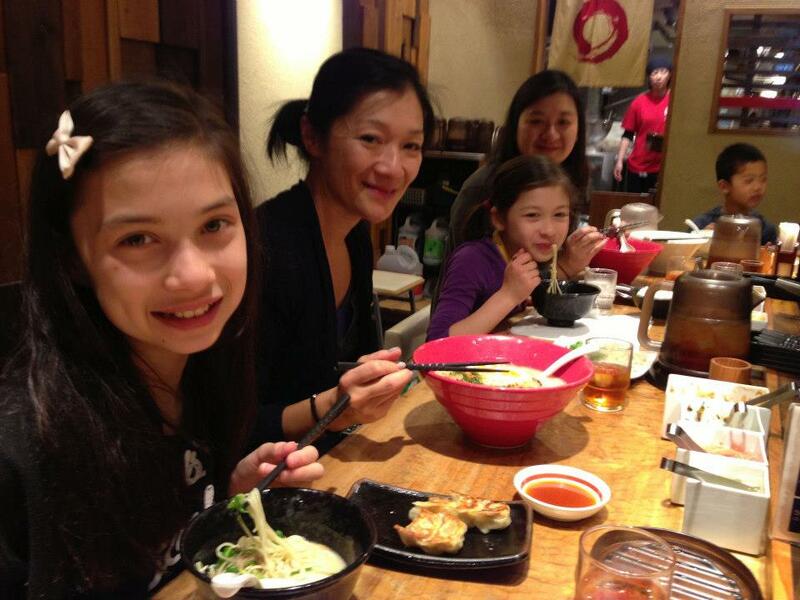 When I arrived in Osaka, all craziness with my family ensued and I became a food follower more than a leader. In most situations, this may concern me, but eating in Japan is so good that I didn’t mind just going along with other people’s dining choices. As the trip went by, my parents were becoming increasingly sensitive to my niece’s food particularities and that awareness to try to find restaurants they’d like also rubbed off on me. And so, on an afternoon where my sister and I took the girls shopping, we ended up on a department store restaurant level wandering around to find something that would satisfy the girls. 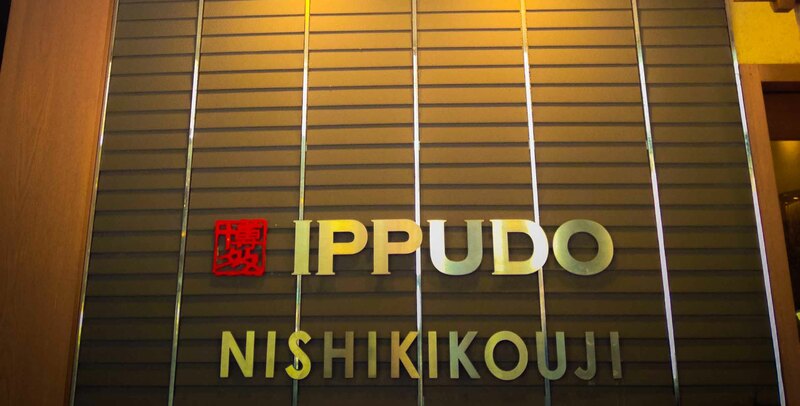 We settled on a yoshoku (Japanese-style western food) and I was satisfied with my omurice, but then I heard that without us, my parents went to Ippudo in Osaka for lunch and it was amazing. I was so jealous and Ippudo immediately shot to the top of my “must eat” list. The food gods were with me and on a Sunday morning as I was wandering around the Nishiki market in Kyoto, I noticed there was an Ippudo right around the corner. I was excited because I knew I could convince my brother to come back for lunch that day. What I didn’t count on was that the whole family would be interested and we would try to get into a small noodle joint with 7 of us. We were lucky because Ippudo was able to accommodate us around their communal table together, even though we were given a bit of a look when we arrived with such a big group. I hummed and hawed over my choice of going with the more traditional Shiromaru hakata style ramen or try the Akamaru, which adds their special miso paste to the broth. It’s the same debate I have at home when I eat ramen (although the choices are usually shio, shoyu or miso) and in the end I chose, as I always do, the one with the miso in it. It smelled so good inside the restaurant and I was so excited to be moments away from ticking Ippudo off my list. 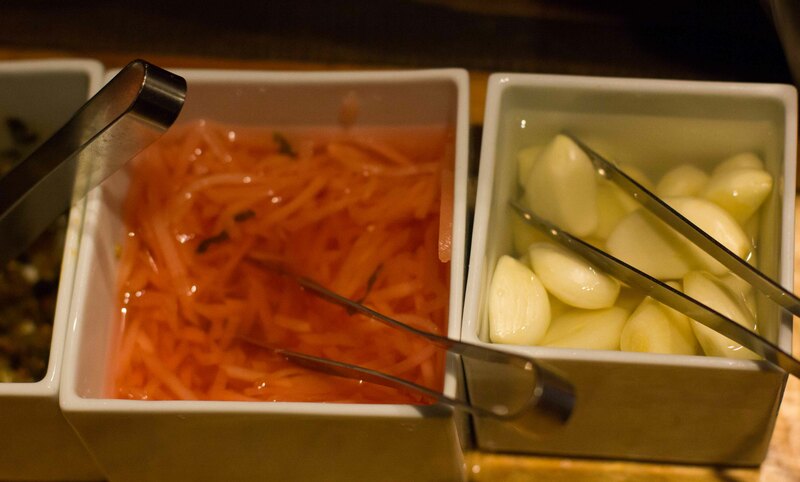 While I waited, I sampled the ramen accompaniments that were sitting in front of me. Shoga (pickled ginger) and whole cloves of garlic.For the record, I didn’t sample the raw garlic. My parents mentioned the gyoza were good, so we ordered a few plates to share. 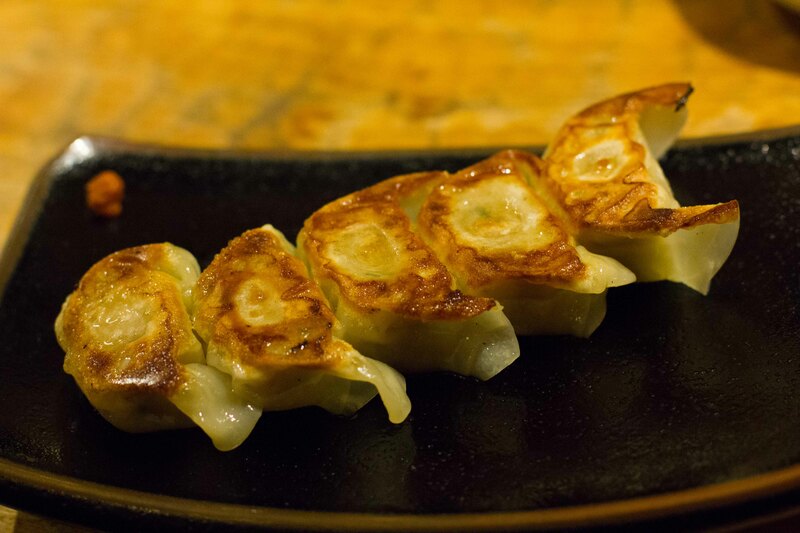 The gyoza weren’t just good, they were great! Gyoza is a must when I have ramen.These one-bite wonders were the best gyoza I’ve ever had. My parents ordered a side of steamed vegetables which I stole a bite of. Not anything I’d ever order but it was fresh and simple. 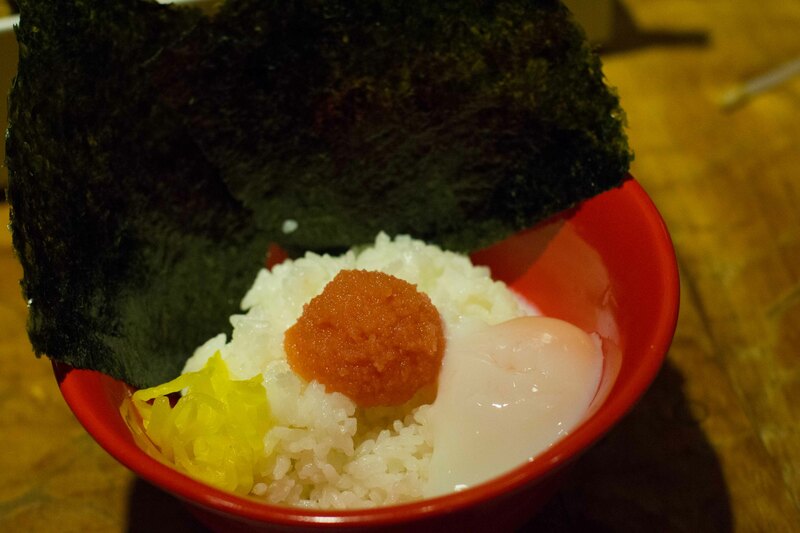 My dad also ordered a rice topped with mentaiko and an onsen tamago. 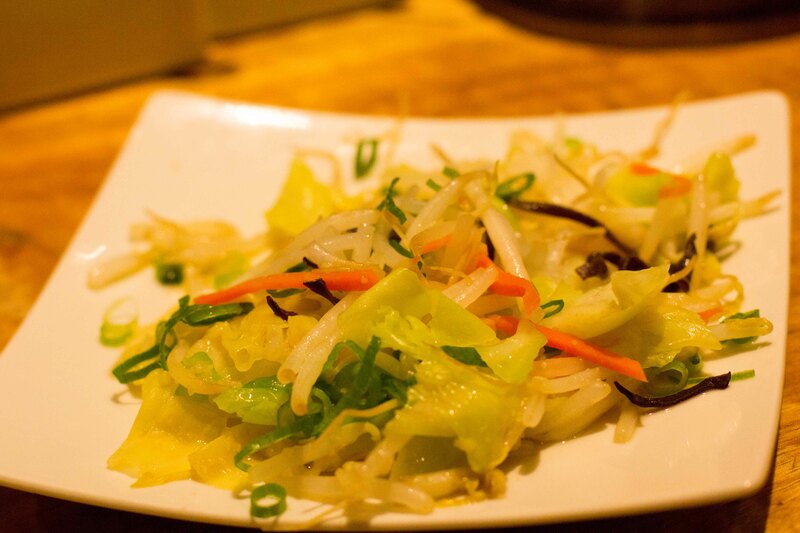 Don’t ask me why, but it’s things like this dish that epitomize my love for food in Japan. My brother’s Shiomaru ramen was delivered and it smelled so wonderful I regretted not ordering the Shiomaru. Vince pressing a whole clove of garlic into his bowl. When my Akamaru ramen hit the table, I was so eager to try it that I forgot to take a photo of it on delivery. Akamaru ramen – Original silky “tonkotsu” (pork) soup topped with Ippudo’s secret “umami dama” miso paste, pork chashu, cabbage, scallions and fragrant garlic oil. My “must add-on” is the nitatamago (seasoned soft boiled egg) which was perfect. It was hard to stop eating my bowl to take the photo. 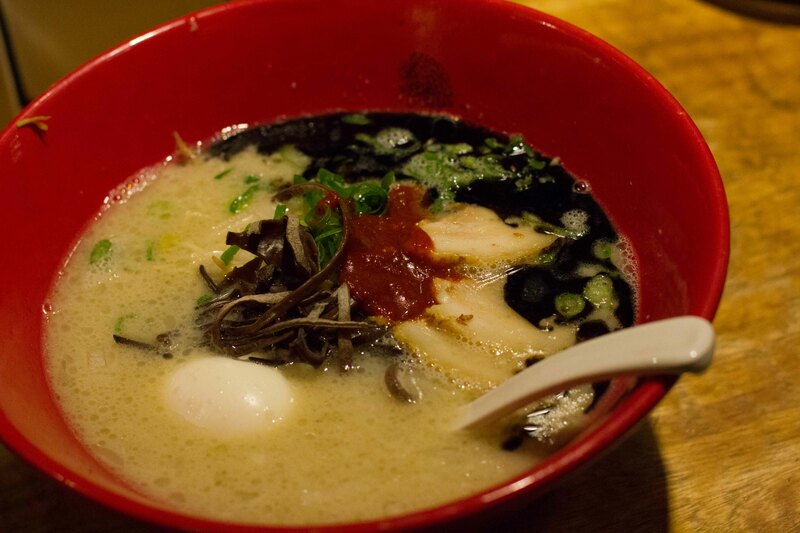 The broth was creamy and complex and the miso & black garlic oil added depth of flavour. I loved the thin “Hakata-style” noodles, which reminded me that up to this point, my favourite bowl of ramen I’d had was also Hakata ramen eaten on the street in Fukuoka. I have to admit, when everyone decided to go for lunch at Ippudo, I was a bit worried that the girls weren’t going to like the ramen and that the whole experience would be stressful. Looking back, I had nothing to worry about because good food is good food. 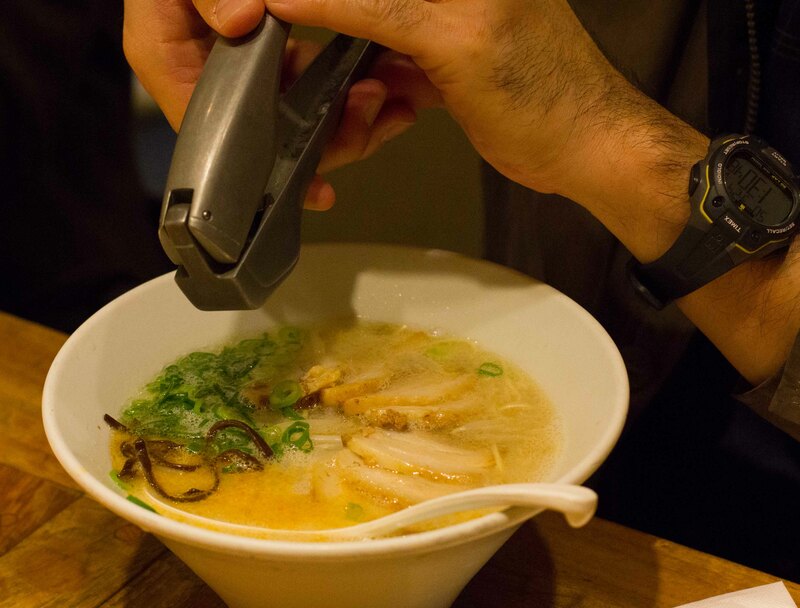 Or at the very least, everyone loves a great ramen! 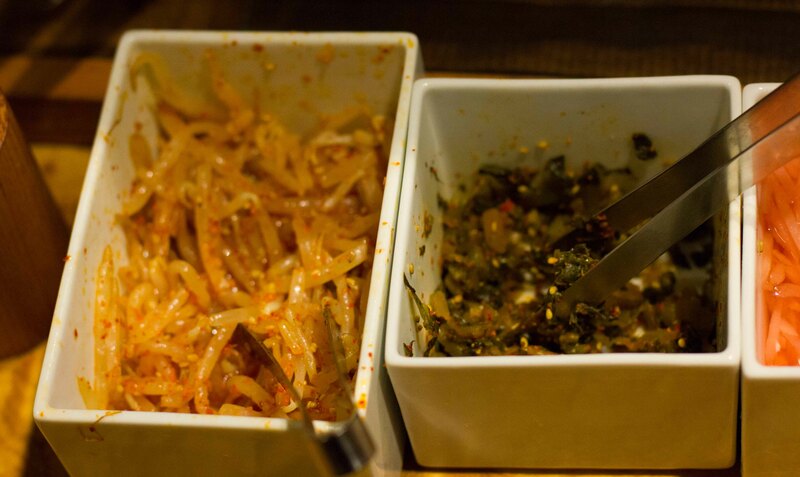 Looks like you don’t just go for the ramen but also the sides. I don’t eat ramen often, but usually I am adequately full ofter a noodle soup so I don’t get any sides. The black garlic oil sounds amazing and very chic. Thanks for reading! 6 months in Tokyo would be amazing. Even though I was just there earlier this year, I’m still trying to figure out an excuse to go back again soon. Enjoy Rakutei, I can just tasted the wonderful ebi now!! !